API POND AMMO-LOCK Pond Water Ammonia Detoxifier detoxifies ammonia and neutralizes other toxic chemicals in tap water and ornamental ponds to make it safe for fish. This ammonia detoxifying solution removes chlorine and chloramines from tap water, and detoxifies ammonia continually produced in the pond by waste matter. 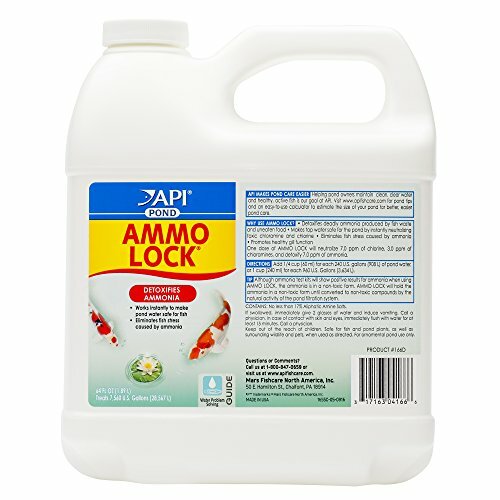 API POND AMMO-LOCK locks up ammonia, converting it into a form that not only is nontoxic to aquatic life, but serves as a source of nutrition for nitrifying pond bacteria in the biological filter. This solution works instantly to eliminate ammonia stress and promote healthy gill function of pond fish. With API POND products, it’s easy to keep a beautiful pond. For over 50 years, API has been creating innovative, research-driven solutions that make it easier to care for your pond. API POND Pond Treatment Supplies are designed to work in conjunction with each other to provide best results to control algae, promote healthy bacterial growth and help control and cure fish diseases and conditions such as ich and fin rot. They work to provide a safe, hospitable environment for fish such as koi, catfish, perch, goldfish and more. With API, you can spend more time admiring your fish, and less time scrubbing your pond. Make sure to use all products as directed in order to ensure the best results.